Moose hunting is not a simple sport. As much as we wish, we cannot simply wander into the wilderness and hope for the best. If hunting moose is something you have been thinking about trying for a while now, refer to our advice before heading into the woods. There are many things to remember, practice and understand. Try to look for signs of moose before the big hunt. Many times you will find fresh and old moose signs and being able to recognize the difference is very important. If you see fresh beds, tracks or scrapings close to the rut that will help you determine where to post. Not sure where to start looking? Try hunting near ponds or lakes since these areas provide water and great food sources. Try to also only concentrate on one to two areas only at a time, if you are focusing on multiple areas, then that leaves many areas unwatched in great hunting times and your chance of spotting a moose becomes smaller. When hunting, try finding areas that are undisturbed from other people, hunters, roads, traffic etc. You’ll have a better hunting experience if you find secluded areas, since moose are more likely to settle in their habitat if they feel safe and comfortable. If they feel disturbed or threatened they will most likely move on and settle elsewhere. Talk to people who are familiar with the area you’re considering. Perhaps find conservation officers, trappers, forestry workers or ask employees at Mattice Lake Outfitters, we take pride in helping our customers so they have the best hunting experience. 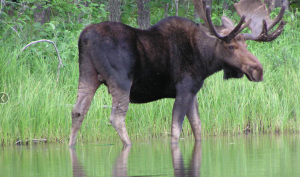 We have three mini hunt camps located on small lakes that we utilize for moose hunting only. We have a high success rate due to healthy and plentiful herds of moose within the area. If you’re interested in moose hunting in the beautiful wildness of Northwestern Ontario, contact us today to plan your trip.